We carry a great selection of noiseproofing sealants for your soundproofing project, including acoustical caulk sealant, putty pads, glues and more. Acoustical sound sealants such as Green Glue are essential for reaching areas that panels and fabrics can’t, such as small cracks or spacing around windows and doors. These noiseproofing sealants work by reducing resonant frequency of surfaces, which makes them a great choice for recording studios or home theaters. 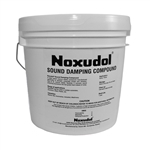 For heavy machinery or other areas where loud noise is frequent, sound-damping compounds such as Noxudol are ideal. They help reduce noise and vibration around heavy machinery by converting the sound energy into very small amounts of heat and can be applied over large surface areas. We only carry the very best acoustic sound sealants at SoundAway. All of our sealants for sale are nontoxic, environmentally friendly, easy to apply and proven to perform. Shop today and contact us if you have any questions! Professional quality Acoustical Caulk Sealant, 28 oz tube, is designed to dampen sound between room surfaces. Seal cracks between walls, ceiling, and floors to minimize sound leaks. Acoustical Caulk is also referred to as noiseproofing sealant. 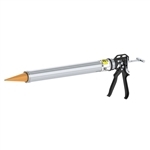 Caulk Gun Applicator is designed to hold any standard, quart-sized Acoustical Caulk or Green Glue or PolyFoam Construction Adhesive tube. 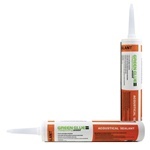 Green Glue, 28 oz tube, is a liquid, waterborne, viscoelastic damping compound representing the highest performance soundproofing product of its type. Green Glue offers superior performance in lowering the resonant frequency of walls, ceiling, or floor surfaces. Green Glue uniquely serves as a sound isolator and sound dampener to produce a higher STC. Buy Green Glue by the case and Save! Noxudol 3100, 17 oz aerosol can, is a water-based, viscous elastic compound manufactured specifically to dampen unwanted sound and vibration. Noxudol 3100 converts sound energy into minuscule amounts of heat energy resulting in an overall noise reduction. In addition to its sound damping properties, Noxudol offers rust protection and is fire-retardant. FireStop Putty Pads Quad Pack, 4 pads, 3/16" x 7.25" x 7.25"
FireStop Putty Pads, 4 per pack, 3/16" x 7.25" x 7.25", offer fire protection and sound control in a release lined pad for easy installation to electrical boxes or other room surface penetrations. SoundAway FireStop Putty Pads are made from a flexible, non-hardening compound designed to expand thus creating an air-tight seal. Green Glue Pail Applicator is designed for use with the 5 gallon pail. Sound Damping sheets, 10 per box 0.625" (1/16") x 12" x 18", are engineered to dissipate mechanical energy associated with vibrating or ringing surfaces. Sound is diminished as the damping sheets extend and compress. The Damping Sheets are lightweight applied by exposing the adhesive on one side of the sheet. Professional quality Acoustical Caulk Sealant, 28 oz tube, is designed to dampen sound between room surfaces. Seal cracks between walls, ceiling, and floors to minimize sound leaks. Also referred to as noiseproofing sealant. There are 12 Acoustical Caulk Sealant tubes per case. FireStop Putty Pads, 20 per box, 3/16" x 7.25" x 7.25", enhance the overall soundproofing quality of your wall or ceiling. FireStop Putty Pads offer fire protection and sound control in a release lined pad for easy installation to electrical boxes or other room surface penetrations. FireStop Putty Pads are made from a flexible, non-hardening compound designed to expand thus creating an air-tight seal. Noxudol 3100, one gallon, is a water-based, viscous elastic compound manufactured specifically to dampen unwanted sound and vibration. Noxudol 3100 converts sound energy into minuscule amounts of heat energy resulting in an overall noise reduction. In addition to its sound damping properties, Noxudol offers rust protection and is fire-retardant. A Green Glue Pail contains 5 gallons of a liquid, waterborne, viscoelastic damping compound representing the highest performance soundproofing product of its type. Green Glue offers superior performance in lowering the resonant frequency of walls, ceiling, or floor surfaces. Green Glue uniquely serves as a sound isolator and sound dampener resulting in a higher Sound Transmission Class (STC). Covers 365 SF at a rate of 28 oz per 16 SF.